The second album from UK-based Senegalese griot Jali Fily Cissokho (brother of Solo, he of Ellika and Solo renown) is a smartly played but uneven affair.Cissokho’s robust kora playing and soaring vocals are aided by sister Adama (also on vocals), multi-talented nephew Sekou Keita on percussion and a talented backing band from his native Casamance on a mixture of traditional griot songs and new compositions. Binta Jagn is an example of the group at their best, with a charming duet between the two singers and some delicate touches on kora from Jali Fily. 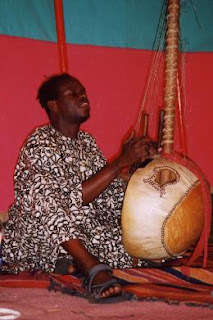 And Demba Walimagn features a series of ringing electric guitar lines from Zacharia Diatta that dance around energetic talking drum from Keita. The closing instrumental, Dunia, appeals too, guest David Lord adding atmospheric washes of keyboard to the unfolding lines of melody from Cissokho's kora. But there's a rough edge to the production that doesn't do justice to some of the busier tracks, causing the instruments to coalesce into a disappointing sonic murk at times. This is a pity, because Jali Fily Cissokho was part of the electro-kora big band Jalikunda, and some of the up-tempo moments on this recording hint at the rocking Mandé sound produced by that. Cissokho delivers his vocals with a passionate intensity (although his range is limited) to which Adama lends expressive support, so with clearer production values, perhaps a bit more support on vocal and a spruced up presentation (the CD sleeve photography in particular has an air of cheap and cheerful to it), you get the feeling that Jali Fily Cissokho and his Coute Diomboulou Band are capable of producing something really quite special next time round. This review first appeared in fRoots magazine.